Dynamic Duchess Cosplay has been an avid cosplayer since 2016. While she’s renowned for her RWBY cosplays, Dynamic Duchess is also notorious for her love of villains, psychopaths, and yanderes. 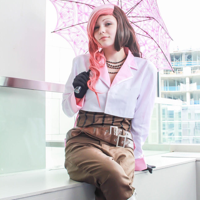 You’ll catch her as Neapolitan of RWBY, D.va from Overwatch, and Widowmaker from Overwatch.